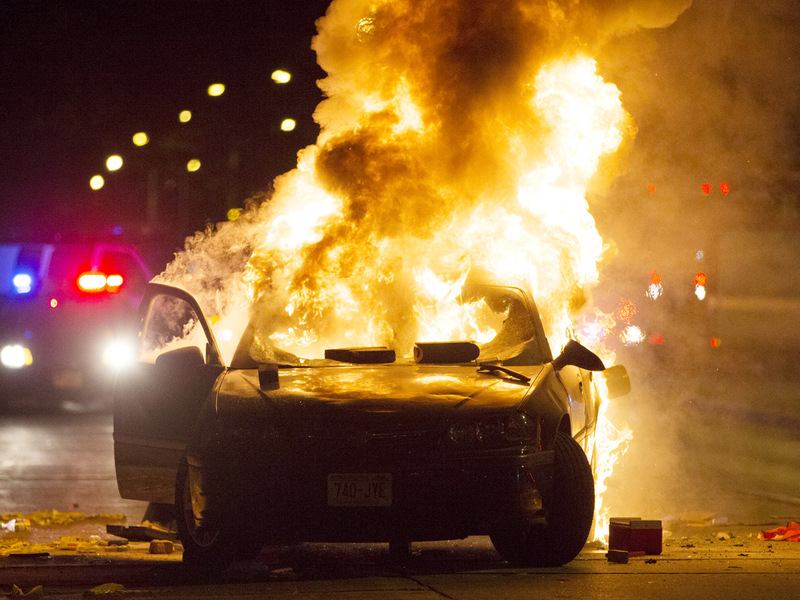 MILWAUKEE - A crowd of protesters skirmished with police Saturday night in a Milwaukee neighborhood where an officer shot and killed a man after a traffic stop and foot chase earlier in the day, setting fire to a police car and torching a gas station. One officer was hurt by a thrown brick. Police said the 23-year-old man was armed with a handgun. Mayor Tom Barrett said the officer ordered the suspect to drop the weapon, but he refused. The officer then shot the suspect twice, Barrett said, adding that the officer was wearing a body camera. Assistant Chief Bill Jessup told the Milwaukee Journal Sentinel that it wasn't immediately clear whether the man had pointed a gun or fired at the officer. They described the man as a suspect, but didn't say what led to the traffic stop. The races of the man and the officer weren't immediately released. Police tweeted that shots had been fired and at least arrests were made. Arrests made in area of disturbance. MPD continues efforts to disperse crowd. Gas station at Sherman and Burleigh set on fire. MFD cannot extinguish fire as gunshots are being fired. MPD officer undergoing treatment at local hospital after brick thrown through squad window, striking officer in the head. Large police presence in area of Sherman and Auer. Officers working on peacefully dispersing crowd. It was at least the second confrontation at the intersection, following an earlier standoff involving more than 100 people pushing against 20 to 30 officers. Officers got in their cars to leave at one point and some in the crowd started smashing a squad car's windows. Another police car was set on fire. The newspaper also reported that one of its reporters was shoved to the ground and punched. The Police Department tweeted that one officer was taken to a hospital after he was struck by a brick thrown through his squad car window. Police also tweeted that a gas station had been set on fire. Firefighters initially couldn't extinguish the blaze because gunshots were being fired, but they had started fighting the fire by midnight local time, authorities said. A bank on Milwaukee's north side was also set ablaze. Smoke could be seen billowing from The BMO Harris branch a few blocks away from the intersection where as many as 100 protesters skirmished with police earlier Saturday evening. It was at least the fourth building to burn, following a BP gas station, an O'Reilly Auto Parts store and a beauty supply store. Footage from a news helicopter also appeared to show a small grocery store had been looted. At a news conference, Barrett urged parents of anyone at scene of unrest to "get them home right now." Police Capt. Mark Stanmeyer said in a news release that the two people in the car got out and ran and that the officers chased them. He said a man who was one of the people fleeing was armed with a handgun and was shot by an officer during the pursuit. He said the man died at the scene. The man's name wasn't immediately released. Stanmeyer said he had an arrest record, and that the handgun he carried had been stolen in a March burglary in suburban Waukesha. The gun held 23 rounds of ammunition, Barrett said. The 24-year-old officer who shot the man has been placed on administrative duty. The officer's name wasn't immediately released. He has been with the Milwaukee department six years, three as an officer.